Originally published at Scientific American. Do NOT EAT the chemicals. It is the #1 laboratory safety rule young scientists learn to never break and for good reason; it keeps lab citizens alive and unscathed. However, if it hadn’t been for the careless, rule-breaking habits of a few rowdy scientists ingesting their experiments, many artificial sweeteners may never have been discovered. Perhaps the strangest anecdote for artificial sweetener discovery, among tales of inadvertent finger-licking and smoking, is that of graduate student Shashikant Phadnis who misheard instructions from his advisor to ‘test’ a compound and instead tasted it. Rather than keeling over, he identified the sweet taste of sucralose, the artificial sweetener commonly known today as Splenda. Artificial sweeteners like Splenda, Sweet’N Low, and Equal provide a sweet taste without the calories. Around World War II, in response to a sugar shortage and evolving cultural views of beauty, the target consumer group for noncaloric sweetener manufacturers shifted from primarily diabetics to anyone in the general public wishing to reduce sugar intake and lose weight. Foods containing artificial sweeteners changed their labels. Instead of cautioning ‘only for consumption by those who must restrict sugar intake’, they read for those who ‘desire to restrict’ sugar. Today, the country is in the middle of a massive debate about the health implications of artificial sweeteners and whether they could be linked to obesity, cancer, and Alzheimer disease. It’s a good conversation to have because noncaloric sweeteners are consumed regularly in chewing gums, frozen dinners, yogurts, vitamins, baby food, and particularly in diet sodas. As research delves deeper into these issues, scientists are gaining a greater understanding of how these sweet synthetic alternatives impact the brain. From engagement mechanisms of the brain’s central taste pathways, to uniquely altering the food reward-system response, we are learning that substituting one sweet taste for another by switching from sugar to artificial sweetener does not fool the brain. This brilliant organ knows the real deal even if your taste buds can’t detect the difference. The moment sugar touches your mouth a complex cascade of events is triggered involving taste, learning, memory, and reward systems in the brain. The central taste pathway begins with your tongue, which has specialized cells that relay information about taste through cranial nerves to the brain. Taste information is then transmitted through several brain regions before arriving in the primary taste cortex, which is made up of the frontal operculum and the anterior insula. Neurons in the primary taste cortex send projections to areas associated with the brain’s primary reward-pathway located in the dopaminergic midbrain. Neurons within the midbrain then go on to innervate various brain centers that participate in the food reward response (i.e. amygdala, caudate nucleus, and orbitofrontal cortex) and release dopamine, a neurotransmitter commonly associated with reward and pleasure. The body’s food-reward system plays a critical role in regulating eating behavior and controlling the number of calories you consume. Evolutionary survival mechanisms in the brain place emphasis on the value of high calorie foods and thus we find sugar satisfying so that we will continually seek it out. Say you have a box of cupcakes. The initial bite is bliss. In that first taste, dopamine is released in the brain’s reward pathway and you get a jolt of pleasure. In addition to dopamine, the release of leptin, a hormone that regulates appetite and informs the brain when you are full, reduces activation of dopamine neurons in the midbrain, lowering the reward value of sugar. As a result, the second bite of the cupcake is less rewarding than the first and you begin to feel full with subsequent bites, hopefully stopping you from gorging yourself on the entire box of cupcakes. What if instead you ate an artificially sweetened cupcake? Does indulging in artificially sweetened food and drink impact the central-taste and reward pathways in the brain? Functional magnetic resonance imaging (fMRI) studies have investigated this question and revealed some interesting findings. In a study conducted by Frank et al., 12 healthy women underwent brain scans and were asked to rate the pleasantness and sweetness of several different sugar (sucrose) and artificial sweetener (sucralose) drinks on a scale of 1 (‘did not like the taste’) to 9 (‘extremely enjoyable’). Researchers found that both sugar and artificial sweetener activate the primary taste pathway in the brain by activating the frontal operculum and the insula, but only real sugar was able to elicit a significant response from several brain regions of the taste-reward system including the midbrain and caudate nucleus. This suggests that the brain’s reward pathway is conditioned to prefer a sugar, or caloric-based, stimulus. At the San Diego State University, researchers recruited 24 individuals for an fMRI study to look at brain activation of habitual diet soda drinkers and non-diet soda drinkers. Study participants were grouped as diet soda drinkers if they drank at least one diet beverage a week. 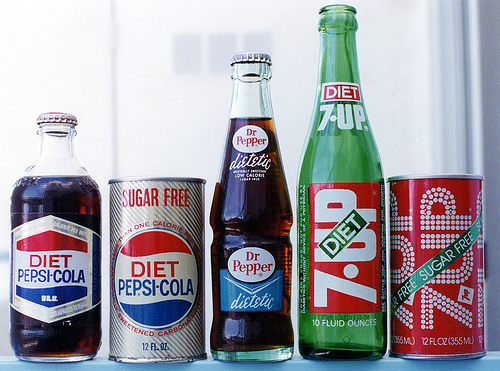 On average, diet soda drinkers in the study consumed 8 diet beverages a week. During the brain scan, subjects were provided with random intermittent sips of sugar (sucrose) water and artificially sweetened (saccharin) water. After each trial taste, they were asked to rate drink pleasantness and given distilled water to cleanse their palate before the next trial. Green and Murphy found that chronic diet soda drinkers had greater overall activation in several reward processing brain regions to both real sugar and artificial sweetener, compared to the non-diet soda group. Additionally, within diet soda drinkers, the brain’s response to sugar vs. artificial sweetener was nearly identical in the orbitofrontal cortex, dopaminergic midbrain, and amygdala, suggesting regular consumption of diet soda may render particular components of the brain’s reward system incapable of distinguishing between real sugar and artificial sweetener! Furthermore, while certain components of the reward pathway were numb to sweet taste type, researchers found that the more diet soda an individual consumed, the lower their activation was in the caudate nucleus. Thus, people that drank the most diet soda had the least activity in the caudate head region. Taste and reward signaling in the brain is immensely complex. Research is only beginning to understand how altered brain activity with prolonged use of artificial sweeteners may impact our health long-term. While previous studies have shown an association between obesity and decreased caudate head activation during food-reward tasks, a link between artificial sweeteners altering brain activity in the caudate head and obesity has not yet been established. Future fMRI studies as well as looking at how appetite hormones, like leptin, alter the brain’s reward pathway after regular use of artificial sweeteners could further piece together this incomplete picture. Even if you aren’t married to the clean eating fad, the take home message is that real sugar or not, moderation is key for a healthy brain-reward response. Or as Cookie Monster with his new health-motivated outlook might put it: cupcakes are a sometimes food.